Updated (Jan 22, 2015): Congratulations to the winner- @rreemabhatia, @reyaraja and @nancyalcantra01. Please send me a Facebook message with your contact details and delivery address. Labello is one of those lip balms/ chapsticks that are reminiscent of colored lips. My very first one was rose colored and it was the perfect 'lipstick' at that time- a natural rosy shade that had an almost matte finish. Fast forward to today and Labello has a plethora of lip balms to suit every girl- there's Milk & Honey, Watermelon, Cherry, Cranberry & Raspberry and much more. I for one, love the Cranberry & Raspberry lip balm. You have got to practice some self-restraint though. The lip balm has an incredibly delicious fragrance (almost like a raspberry cheesecake). And now, you can try it for yourself! 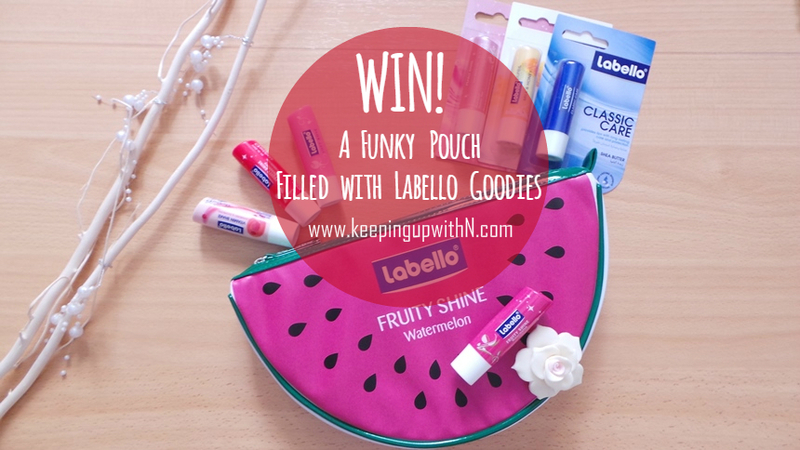 I've partnered with Labello to give 3 of my readers a watermelon print pouch filled with Labello lip balms. Say goodbye to dry lips! You'll have fun going through all the balms and finding your favorite. Sounds awesome? Want to win this? 2) Like my Facebook page and Twitter- here and here. 3) Confirm below with your Instagram username. Followed all the steps.. So wish to win.. Thanks for the lipilicious giveaway. Done all steps ! . My Instagram Username is : Perfectunme .. Thanks for this lovely giveaway ..
Hello dear, Following Labello on IG, Following you on FB & Twitter. thanks for fabulous giveaway ..